In the days when the PDF and web page is seen as the go to answer, print obsolescence is still a hot topic in the sales departments across the UK. Producing too much of something that can quickly change or go out of date is a nightmare, wasteful and easily solved with a digitally printed strategy. But it simply doesn’t need to be the case. It’s funny how so many people have got hung up on paper useage recently, when the majority of the paper we use at carbon colour comes from either purpose grown forests, or part recycled sources that are sustainable and responsible.. The majority of the paper / board we buy and print on comes from one merchant source with whom we have engaged in a capture scheme. As a result of our participation in this Carbon Capture scheme initiated by the Woodland Trust; for example in 2017 we captured 6,996kg of Carbon Dioxide. In itself this meant almost 175 square metres of new mixed woodland was planted as a result of the work we have digitally printed on paper and board that is covered by the carbon capture scheme. In real terms this reflects a complete commitment by Carbon Colour to ensure it uses paper from sustainable sources, that we minimise any unnecessary waste of material and that we remain accountable for the environmental resources that we do use. Because we specialise in short run products our useage is the opposite of other producers who buy paper by the ton, but we know that we can measure our contribution accurately ‘carbon captured’ – and we are proud to be part of this carbon capture scheme. Woodland Carbon is the Woodland Trust’s unique scheme set up to help companies reduce their carbon footprint by locking up carbon emissions through the planting of trees. As a result this allows the Trust to create new woodland and harness nature’s simple and powerful way of removing carbon dioxide from the environment. Unlike many conventional printers we measure our waste by the sheet not the binful, so its easy to be fully accountable and we are more than happy to show anyone concerned about what they deem waste through excess printing, both our studio where the work is produced, and help them audit their collateral from start to finish so we can help identify waste, opportunities to produce on demand rather than in bulk and how slight adjustments in procurement can help reduce obsolescence. Look out for the latest posters we produced for the Perch in Binsey for their forthcoming Beer & Cider Festival. The 4/5/6th of May should be a great time to go see what is on offer. The posters were printed on a 100% recycled paper – its just one of many choices we offer at carbon colour. One of the local artists we have known and worked with over the years is Mike Brain and here has used our recent Christmas canvas mounting offer to show visitors to his current exhibition how they could have a high resolution version of one of his illustrations reproduced. Rather than canvas simply being printed and then stretched over a box frame – these canvases are wrapped to a solid 10mm base which ensures the image remains flat over time and can be used on its own mounted to the wall, or enclosed in a frame. carbon colour also offer hanging plates or stand off’s to add to this method of canvas mounting, depending on how you want to display them – remember other sizes are also available. We recently helped produce some packaging mock ups for a new and clever Christmas tree trac. It is in the early stages of development and hopes to be funded and in production ready for delivery of product Christmas 2019. Find out more details of how you can get your hands on one here or find a video of the trac here. Or see more below. With the option for tunnels and fixings to almost any kind or size of tree the Halo-Trac system gives you effectively a floating platform – or you could think of it as a Christmas tree train platform – around which the train can travel. 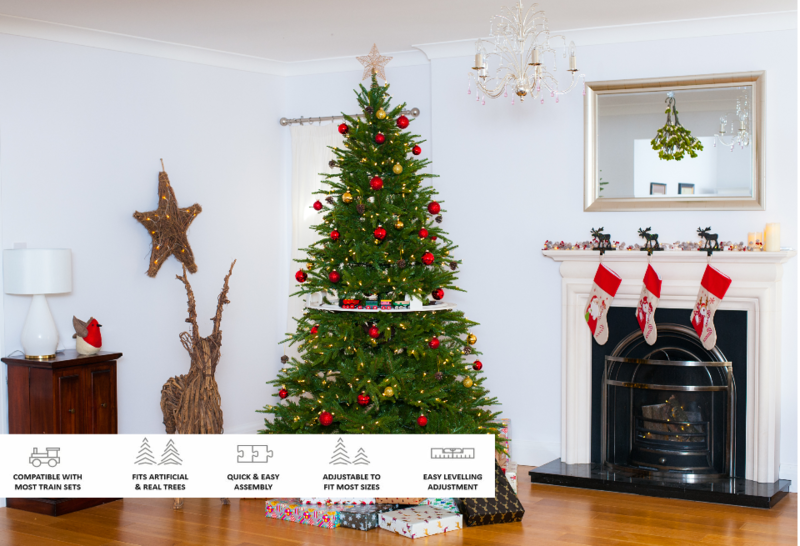 You can elevate your Christmas train set up off the floor, running it amongst the branches, for all the family to enjoy – displayed in the centre of your Christmas tree. The HALO-TRAC™ floating platform is currently not available to purchase. However, we are running a crowd funding campaign on KICKSTARTER to raise the funds to enable us to start manufacturing. Please support our project and in return you will receive your own HALO-TRAC™ floating platform ready for Christmas 2019. Please take a look at our KICKSTARTER project. 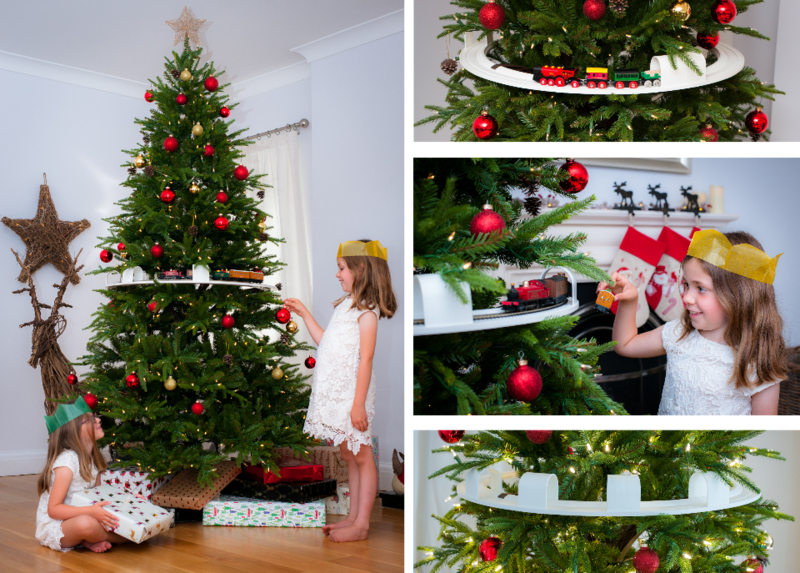 The HALO-TRAC™ floating platform allows you to elevate your Christmas train set up off the floor, and in amongst the branches of your tree, for all to enjoy! The HALO-TRAC™ floating platform has been designed to be compatible with either a ‘OO’ scale model train set (1st radius curves) or battery operated trains and vehicles that are used with wooden railway track systems. at carbon colour we can help you with making Christmas this year that bit extra special with your very own Christmas Cards and Calendars. Whether you need a simple calendar to promote your organisation or business, a card to wish your clients, colleagues or friends well at this festive time or something more elaborate we can help. Come and see us – we have examples of a range of formats and lots of alternative materials to choose from. From the simplest folded card to a complex desk calendar – carbon colour can produce it all in house. If you want to raise funds or sell commercially we can pack, supply matching envelopes and cello bags. We can die cut your Christmas Cards to shape, glue things on, add glitter, or stick a mini tied ribbon bow on them, put them in peel and seal envelopes or ones with diamond flaps. carbon colour can scan your original art, help with colour matching or re-touch out imperfections, collate your calendar, artwork cards or calendars – and we always show a made up printed proof where time allows. it’s the end of the month and Halloween today – there’s pumpkins all over the place and some of them are much larger than others. this one was being cut by Frankie Taylor just up the road in Sutton Courtenay – its a little over 500mm wide and looks great when it’s lit up. Have a fabulous Halloween wherever you are going to be this year. wiki tells us Halloween or Hallowe’en (a contraction of Hallows’ Even or Hallows’ Evening), is also known as Allhalloween, All Hallows’ Eve or All Saints’ Eve, and is a celebration observed in a number of countries on 31 October, the eve of the Western Christian feast of All Hallows’ Day. It begins the three-day observance of Allhallowtide, the time in the liturgical year dedicated to remembering the dead, including saints (hallows), martyrs, and all the faithful departed. Chandlings School are the latest in a list schools in Oxfordshire who have turned to carbon colour to help redesign and produce their school brochures and prospectus. This prep school prides itself in giving its children an active and encouraging start – and says to its pupils ‘If you are going to do something, do it well’. Something we tried to echo in everything we are asked to do for them. Its a great ethos, and one we enjoyed applying. With the added advantage of being provided with some great photography we simplified the look of their literature, emphasised the use of the existing corporate colours and added a gently modernistic edge to the layout. By keeping things simple the new suite of materials started to come together as a whole. This allowed the school brand to be reinforced, its identity helping to show their unfussy approach to documents and the images of the children being active, engaging in sports and social events worked well in the school brochures and prospectus. As well as in their regular newsletters. Adding Gold Foil Vinyl to a relatively small number of personalised Gold Playstations for the National Lottery to celebrate the locations around the country that sold the winning tickets is one of the latest ideas put in place by the PR companies used by Camelot to promote the various games offered. We used Gold Foil Vinyl to highlight the game, the winners name and the amount won, the winner was then asked to add a gold handprint to the new Gold Playstations that have been launched, and installed into the stores that sold them their successful ticket. Base printed inlays were laminated, die cut to shape and then contour cut vinyl in a Gloss Gold Foil Vinyl was applied and distributed across the country to coincide with the winner attending a series of special events celebrating their win where their winning ticket was purchased. The specially made Gold playstations are just part of a campaign to reverse the decline in revenues that has been seen briefly by Camelot. The specially made Gold Playstations are being installed in the locations where the winning ticket was purchased from often with the winner themselves on hand to deliver the unit and add their own message to the play areas. Two of the first gold playstations to leave the warehouse were delivered by the lucky winners themselves. Winners got to cover their hand with gold paint and make a handprint on the Feature area. They could choose to write a personal message too. The nature of their particular win was also featured in Gold Foil Vinyl. Depending on whether they were individuals, belonged to a syndicate and had won on a scratchcard, Euromillions or Lotto. One of our more unusual requests this month was to create some beer bottle labels to support an exhibition event. It was to help promote a spe cialist packager provider who focuses on packaging for the safe transport, storage and disposal of radioactive materials. From the clients brief to production of the labels we only had a couple of days to create artwork for two variants. Then we printed in colour onto a brushed metallic base and contour cut them. Ready for the bottle labels to be applied. The craft beer the client had purchased from their local brewer. There were two types of beer involved, a light and a dark – so apart from the obvious text that needed to alter, used to describe the product, its density and ABV the differentiator – the client wanted to replicate a style that their industry contacts would recognise. Most of us realise (albeit subliminally) that we can be seduced or attracted to well designed products. Whether we know it or not. At exhibitions and trade shows it is so easy to have everything blend together visually. All you need is a simple concept, a hook or focus and a designer to work with. With a well designed idea you then you stand a very good chance of standing out from the competition. Using everything design offers you will help act as a differentiator. Don’t just do what you did last time, especially if the results weren’t that good. Don’t forget who your audience is, why they are there, what will make them stop and engage with you, or remember you. Get with the programme and see if bottle of beer would work for you, or bottle of something else. If you need some help with your next public event, seminar or exhibition come and see what we could do for you. see some example of other stands we have made here. These MOT date prompt and test reminders are great examples of simple client communications – we developed the programme using post as the prime media to communicate with the customers of Motorlux. We designed the cards, printed them and then mailed them – staggering their release to suit the month in which the target vehicle was due to renew its MOT. These A5 cards were the first direct mailing activity we ran at carbon colour using the new Royal Mail barcode PPI which when coupled with the benefits of short run colour printing allows the client to mix its marketing message, target the individual, highlight pertinent data to the recipient and deliver support to the brand. At carbon colour we do all sorts of client communications – we print, pack, collate, stuff, produce envelopes, add labels, match contents, nest forms and information leaflets, collate inserts, seal and prepare for post, or simply finish and pack items and deliver bulk to your door. If you’d like to talk to us about how we can help you design your next piece of outbound direct mail, or solve a particular problem you might have – give carbon colour a call and one of us will be only too delighted to help. One area in which we excel is in dealing with last minute, short run solutions – which might involve adapting an existing idea, executing part of a plan or helping test several ideas at once, to inform measurement and response for a bigger marketing implementation plan.